Raven District was first founded shortly after World War II, and just prior to the 1950’s. Most of the houses in many areas of east and south Houston were built for soldiers and their families as they were returning from war or serving out their terms or being released from service sometime later. With new families came new growing children, and with young boys entering the grade schools the opportunity and desire for Scouting was quickly noticed by the Sam Houston Area Council. By and large, Raven District was one of the very last districts formed within our council and served the limited number of schools in existence at that time. Since those days we have grown to serve no less than six school districts. Currently, Scouting serves youth in Barbers Hill, Galena Park, Sheldon, Crosby, Channelview and Goose Creek CISD school districts, as well as other schools within our district which is more than any other district within our council. Our history is rich, and one of our best examples is Unit 1301 family which has been active for 70+ years. In its’ earliest days, J.P. White was their leader for 40 years. Also, in those early days of our council, it must be pointed out that we had no council camps as we do today. With Mr. White recognizing the need for such a camp for boys and working with the council, he founded Camp J.P. White, which was located by all accounts somewhere near what is now the Houston ship channel not far from the Washburn Tunnel area. The camp was named after him because he funded the camp operations for many years. Upon Mr. White’s death, his will did not include an endowment to support the future of the camp, and eventually due to lack of funding from council, or any other sources, the camp eventually had to be closed. Some years later, in memory of Mr. White, Sam Houston Area Council created a special event area site in the now closed Camp Strake. This was known as J.P. White camporee site. We hope that all named sites and buildings from old Strake will transfer to the new camp when it opens in 2019, and a new generation, as well as currents Scouts can enjoy the J.P. White Camporee site once again. Currently within Raven District, we celebrate and honor this man who gave most of his life to Scouting, our council and to Raven District, by honoring one Raven volunteer Scouter from our district every year with a special award appropriately named after him. The J.P. White Lifetime Achievement Award which is presented annually at our District Dinner. Raven District recognizes registered Scouters for service to youth in the district. Awards are present at the annual Raven District Dinner. The Silver Beaver Award is given to individuals who have made an impact on the lives of youth through service given to the council. The Silver Beaver award is the highest form of recognition that a local council can bestow on a volunteer. Recipients are selected based on their noteworthy service to the Scouting program and community service. The Silver Beaver recipients are recognized at the SHAC Recognition Reception in October. 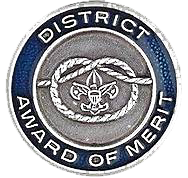 The District Award of Merit is awarded by a district to registered Scouters for service to youth in the district. This is a council-sponsored award that is the highest honor that a district can bestow upon one of its Scouters. Limited to one award for every 25 units in the district. The nominee must be a registered Scouter and must have rendered noteworthy service to Scouts over an extended time. The nature and value of "noteworthy service" may consist of a single plan or action that contributed vitally to the lives of large numbers of youth or it may have been given to a small group over an extended period of time to youth in and outside of Scouting. The recipient receives a plaque, signed certificate, and official knot badge and the Raven District Recognition Dinner.